Guarantee: 100 % Satisfaction Guarantee: Covered by a 30 month warranty. I love this cat tree. Through experience I have come to feel that the most important thing is that it is sturdy. (and it is!!! )It comes with anti- toppling fittings so you can secure it to your wall if you deem it necessary. The extra large perch is great for all sizes of cats. And the three posts are great if you have multiple cats that like to scratch. (like mine do) It is super plush and your cats are going to love it!! This on is super cute and great for accommodating the single cat that wants to lounge on their own. 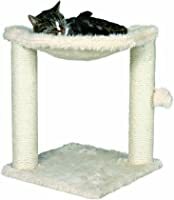 Its very sturdy and has to sisal covered scratching posts holding up a beautiful plush hammock style bed. This one is perfect to place at the end or beside your own bed and give your kitty there own little spot to curl up in and spend the night. 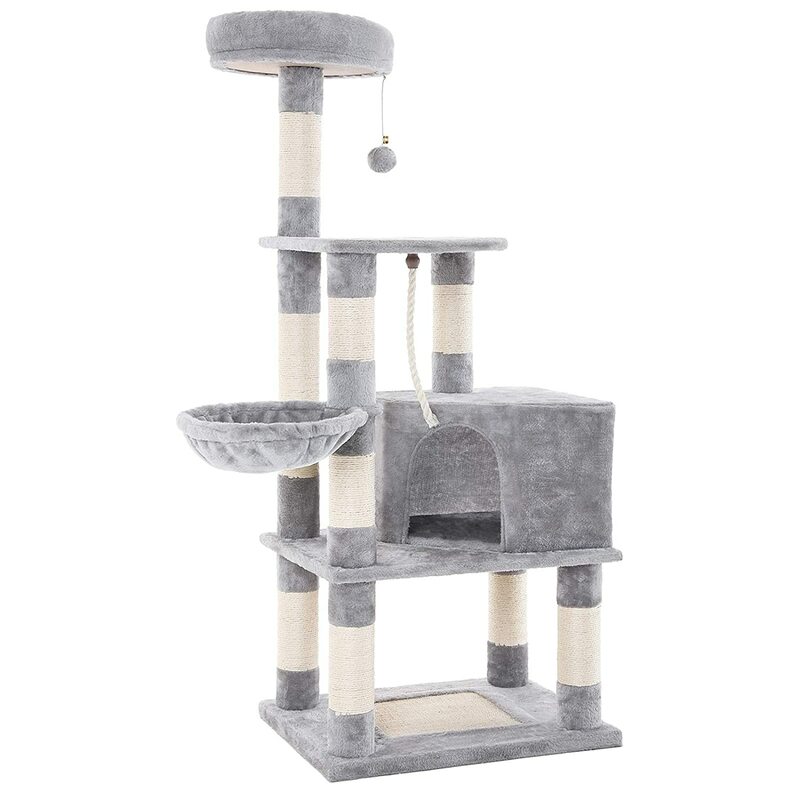 This is a really great multi-tiered cat tree that is very sturdy and also comes with a stability strap that will prevent it from wobbling. I have this tree and my two beloved cats adore it. They can both be on it at the same time and love to play with each other while dangling off the different levels. One of them lays in the condo while the other lays up on the plushy perch. It has a rope to play with and the elastic puffy ball to bat around and obviously the scratching posts which are a necessity in order to keep your furniture looking good!! This is a great tree to put up by a big window so that your baby’s can enjoy the view of the outdoors and keep from getting bored. Love this one! 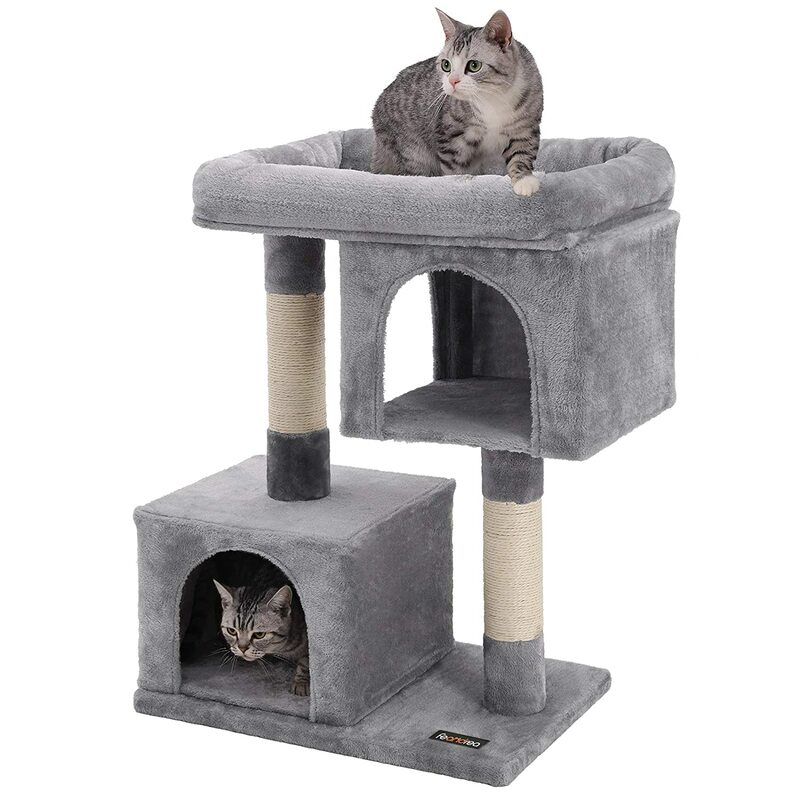 HERE ARE SOME OTHER GREAT CAT TREE’S TO CHECK OUT. KEEP YOUR CATS ACTIVE AND SATISFIED TO SCRATCH ON THE KITTY POST AND NOT YOUR LOVELY FURNITURE.